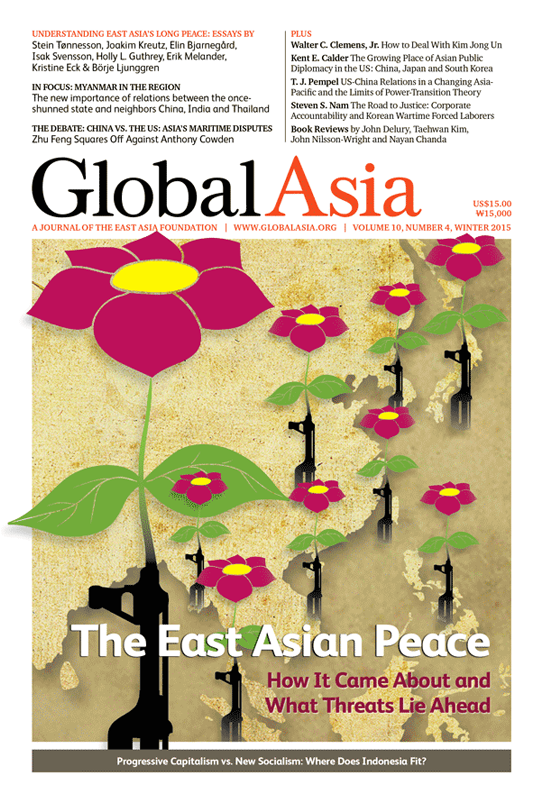 In the cover package of Global Asia’s Summer 2011 edition, we explored the relationship between Asia’s many decades of peace and its much-heralded economic prosperity, and asked, will this last? In this edition of the journal, we revisit the topic of East Asia’s so-called Long Peace, but this time from a much deeper and broader perspective, based on a five-year research project carried out at Uppsala University in Sweden and funded by the Swedish Riksbankens Jubileumsfond. Over the years from 1839 to 1979, East Asia experienced some of the world’s bloodiest wars. Even during the Cold War, East Asia suffered 80 percent of all global battle deaths. But then, that long period of conflict was followed by a period of peace that has lasted now for three-and-a-half decades. Given that remarkable hiatus from armed conflict among nations, scholars have pondered the factors that have underpinned this peace and whether there are lessons to be learned for other parts of the world. The questions that call for answers are many, as Stein Tønnesson writes in his introduction to the cover package: “Is the East Asian Peace just a negative low-quality peace based internally on repression, and externally on a balance of power? Is it a fragile, unsustainable peace, depending on US security guarantees? Or is it a developmental peace that could be the first stage of a genuinely peaceful regional order characterized by economic interdependence, regional and global co-operation and respect for international law?” The answers provided by the eight authors who contributed to this cover package are varied and sometimes contradictory, but they attest to the complexities of the East Asian Long Peace. In our Features section, we provide: a comprehensive analysis of the range of options — most of them unacceptable — for dealing with North Korea; a chronicle of the long legal battles that victims of Japanese wartime forced labor have waged and why this may provide a measure of accountability that has so far eluded politicians in Tokyo; an in-depth survey of the public diplomacy challenges that China, Japan and South Korea face in their dealings with the US; a trenchant refutation of power transition theory as it applies to US-China relations; and a look at how Indonesia’s guiding national philosophy positions the country midway between progressive capitalism and new socialism. Following the recent elections in Myanmar that saw the opposition score a resounding victory over the military-dominated government, attention is increasingly on the geopolitical importance of this once shunned and sanctioned nation. Our In Focus section looks at its strategic importance to three key neighbors — China, India and Thailand. And in our Debate section, we examine what divides China and the US in the ongoing maritime disputes in Southeast and East Asia. We hope you enjoy this latest issue of Global Asia. Please let us know any thoughts you may have at editorial@globalasia.org. It is now 35 years since more than a century of bloody wars came to an end in East Asia. But what are the deep reasons for this remarkable lasting peace, and how fragile is it amid a new set of regional challenges? Introduction: How to explain the region’s extraordinary 35-year period without major conflict. The priority placed on development by East Asian leaders holds the clue to the region’s long peace. What effects did changes in the US-China power struggle and the international system have? Obstacles to true peace include domestic abuse as well as hostility toward other countries and religions. Religious conflict sparks wars around the world. Why has the tinderbox so far not been ignited in East Asia? Credible mechanisms to acknowledge past conflicts and openly deal with them is essential for lasting peace. They enable history problems and power transitions to generate excessive hostility and fear, which may lead to war. State repression and quashing of dissent in many of the region’s nations means peace is enforced and therefore fragile. The Chinese Dream: Does it Challenge East Asia’s Peace? Xi Jinping’s nationalist “Chinese Dream” agenda has the potential to disquiet its neighbors and provoke antagonism. Are China and the US Headed for Confrontation in the South China Sea? For the sake of the future, it is time for the US to lay down a marker on the side of international law. Washington has a wide range of options, but none have yet worked and some are doomed. Engagement and negotiation, difficult as they are, are still the best choice. As Northeast Asians flock to live in the US, their home countries are trying to further their respective national interests. Power transition theory predicts a US-China war. But creative adaptation by leaders in both countries can avert armed conflict. Can fresh momentum in finding justice for victims heal the “memory politics” that dog Japan-Korea relations? Progressive Capitalism vs. New Socialism: Where Does Indonesia Fit? The Southeast Asian giant’s approach, based on its founding principles of Pancasila, may have lessons for the rest of the world. Recent political reforms have upended China’s strategic calculations and apparently unshakeable sway over Myanmar. India has been recalibrating its diplomatic, security and economic approach. Why the rapid warming of relations promises to be a game changer for Southeast Asia. New titles by Tim Marshall; Nikolay Anguelov; Marcel H. Van Herpen; Jan Melissen and Yul Sohn (eds. ); Feng Zhang; Sang-Young Rhyu; Peter Hayes and Chung-in Moon (eds. ); Dominic Ziegler; T.N. Ninan; Richard Cockett; Jairam Ramesh etc.